ART TR-30 SQUALAN OIL is a natural colourless oil, electrolitically purified and stable, non-conductive and endowed with a very high penetration capacity, in addition to being an excellent cleaning agent of LPs and contacts and possessing anti-oxidizing properties, is also an exceptional long-lasting lubricant. In fact TR-30 SQUALAN OIL is a wonderful all-round contact cleaner and preserver. But its main use is for treatment of analogue records. TR-30 is probably the best lubricant available. Due to its very small molecular structure, TR-30 penetrates vinyl and brings back the natural quality of older or alcohol-cleaned records by replacing the original lubricant, which migrates out very quickly. Further, TR-30's lubrication properties are such that groove-tracing becomes much easier for the stylus. Local' hot-spots' on the stylus are greatly reduced, therefore reducing both record and stylus wear. Used on old LPs, it replaces the original lubricant which has been lost over a period of time (owing to wear and removal by commonly used alcohol or chemical based cleaning products and accessories). ART TR-30 SQUALAN OIL, improves the smoothness of the vinyl by reducing disturbance due to existing scratches and protecting it from new ones, plus it increases the tracking of the head without having any negative effects either on this or on the stylus; the result will be to obtain from your LPs a clearer and more detailed sound and a more focalised image. 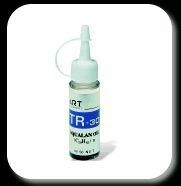 ART TR-30 SQUALAN OIL, if used on contacts, thanks to its particular molecular structure, penetrates the microscopic holes in the metal and forms a thin film which prevents oxidization and protects against wear, preventing damage. ART TR-30 SQUALAN OIL, may be used on all electrical contact, both AC and DC, on valve pins, on wiring terminals, banana plugs, forks, RCA pins, etc.